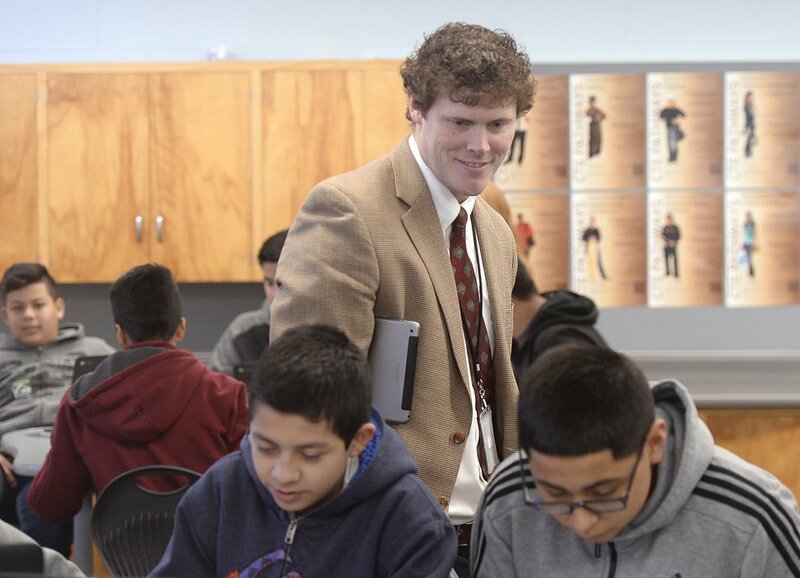 Al Hartmann | The Salt Lake Tribune Principal Tyler Howe visits an 8th grade Americn History class at West Lake Junior High School in West Valley City Wednesday Jan. 25. 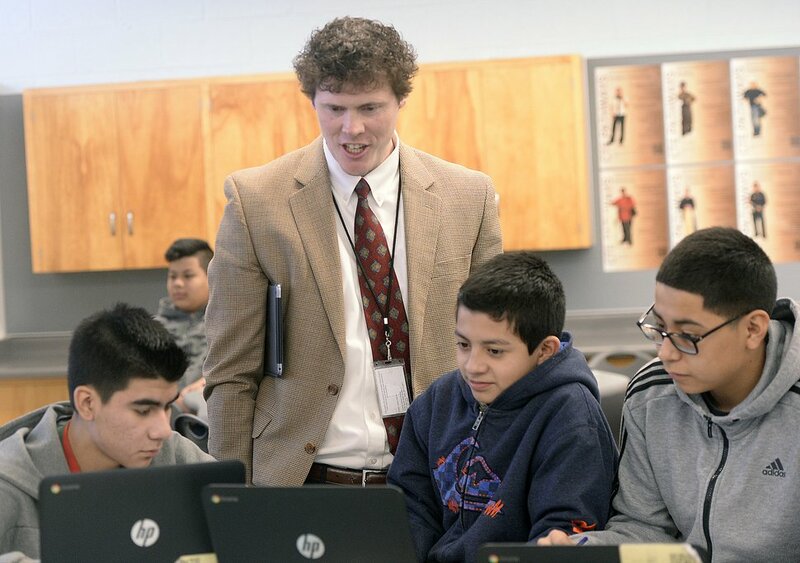 West Valley City • After years of low performance, West Lake Junior High School Principal Tyler Howe is optimistic that his school is on the rise. Test scores are trending up, he said, and teachers have a renewed drive, thanks in part to coaching from the consulting firm Ed Direction. But Howe said it is still hard to hire and retain teachers at a school that is considered failing by the state. "It's definitely got a label," he said. "I think that makes our staffing that much more challenging." West Lake is among the first 26 schools named to the state's $7 million-a-year turnaround program, which hires private consultants to provide training, recommendations and feedback to teachers and administrators at Utah's worst-performing schools. Most of the turnaround schools, including West Lake, are also Title 1, a designation given to campuses with high levels of poverty. Educators say the combination of challenging demographics and demands from the turnaround program provide little incentive for teachers to remain in low-performing schools. Granger Elementary lost half of its teachers in a single year after being named a turnaround school, according to Granite School District spokesman Ben Horsley. "You're putting impossible odds in front of teachers and saying, 'Run with it,' " he said. "Frankly, they have other options. There are plenty of schools out there hiring that don't have some of these at-risk features." A new bill, by West Valley Republican Rep. Mike Winder, is aimed at retaining the best teachers at struggling schools by offering up to $10,000 in performance bonuses. HB212 has 21 co-sponsors, a relatively rare showing of legislative support, and last week earned the unanimous endorsement of the Utah Board of Education. Winder's proposal arrives at a time when the turnaround program's overall sustainability has also come into question, as Utah Board of Education records show that large vendor contracts in the first year have left smaller funding levels for new schools in years two and three of the program. And that funding is reserved exclusively for the private firms. Turnaround schools may be rewarded for success at the end of three years, but no resources are given to administrators to implement the strategies recommended by their consultants. "That's such a glaring flaw," said Mitch Nerdin, Granite District's resource development. "We're going to give you the money that you need to implement at the end, after you've implemented." Victims of success • Under the turnaround program, the worst-performing 3 percent of schools are given three years to improve school grades, which are based on test scores and graduation rates. Success carries the potential for salary and funding bonuses, while failure could lead to a school being closed or forced to convert to a charter school format. Contracts were awarded to consulting firms on the assumption that most turnaround schools would remain in the bottom 3 percent, with funding rolling over year to year. But there was instead widespread improvement, which led to a flood of new turnaround schools and little remaining funding to hire a second round of private providers. "Instead of the estimate of five [new] schools, it became 17," deputy state superintendent Scott Jones said, "something we didn't know a year ago." Turnaround consultants receive half of their payment up front, with the other half dependent on the number of schools that successfully improve their grade after three years. The Utah Board of Education has agreed to pay up to $12.6 million in consulting fees for the first 26 turnaround schools, according to records obtained by The Salt Lake Tribune. To date, $6.4 million has been awarded to the private vendors. With two years' worth of funding already spoken for, the school board has paused the vendor-selection process for the second group of schools and is planning to reduce the amount of funding available for each turnaround campus. Associate state superintendent Rich Nye said there is enough money to fulfill the board's existing obligations, as well as select vendors at a lower price point for new schools. "The money is all there, there's nothing in the red," Nye said. "Had there been another 26 [schools], that would have just reduced further the amount for each school." Nye is adamant that the program is not "trying to borrow from the future." The contracts would have been scaled back without financial pressures, he said. School board member Joel Wright chafes at the suggestion that some schools will receive less help than others. He first raised the issue of funding errors during a recent board meeting, during which he accused staff of allowing "open-ended" contracts to drive the program $8 million over budget. And the 17 new schools in turnaround are more than three months behind schedule — a challenging disruption for these already-struggling schools, according to Nerdin. The law requires vendors to conduct a school appraisal, Nerdin said, but if the vendors are not selected soon, that appraisal will occur at the end of the school year or during summer break. "The time line is supposed to be months and months and months ago," Nerdin said. "If that appraisal and writing a plan is too late in the year, they can't really do it." Senate President Wayne Niederhauser, R-Sandy, sponsored the law. He said lawmakers are communicating with the school board and are willing to step in if necessary. "I haven't dug into it to find out exactly what the problem is," Niederhauser said. "But if there is, in fact, a problem, that's what we're here to do — solve it." Stopping the hemorrhage •Nerdin said his district's turnaround schools are showing improvement. But it's unclear, he said, if it's because of the outside consultants or a renewed sense of urgency after being labeled a failing school. He said training and coaching would still have been prioritized if districts had been allowed to spend their portions of turnaround funding. But that training would have been handled internally, and would have been less expensive. "We would have used it in similar ways," Nerdin said. "But it would have stretched a lot further." Low-performing schools will always correlate with challenging demographics, he said. To overcome that, he said, classroom instruction at a failing school can't be adequate — it must be exceptional. "The impetus behind turnaround should be improving instruction," he said. That idea is at the root of Winder's bill, which invests in teachers who have a track record of helping students improve. The bill uses a measurement called median growth percentile, or MGP, and would trigger an initial payment of $5,000 — increasing each subsequent year — when a high-MGP teacher is employed at a low-income school. "We can have the best consultants in the world with the brightest ideas," Winder said. "But we have to do something to stop the staff hemorrhage." Winder's bill is estimated to cost $600,000, a fraction of the turnaround program's $7 million annual budget. According to new school board data, 56 percent of Utah teachers quit the profession in their first five years, an uptick from a previous rate of 42 percent. Utah Education Association President Heidi Matthews said she appreciates what Winder is attempting to do. But the bill promotes retention at a segment of Utah schools, she said, while the education system is experiencing widespread job dissatisfaction. "My hope is that the legislature will once and for all have the courage to address the real root cause of the teacher shortage," Matthews said, "which is chronic underfunding of public education here in Utah." 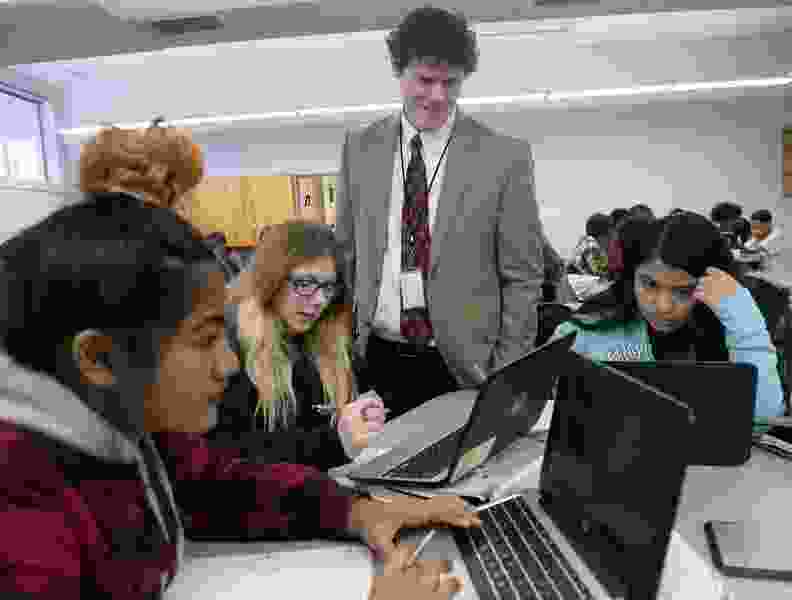 Tougher turnaround •The private firms providing services to turnaround schools include School Improvement Network, Innovations Educational Consulting, Catapult Learning West, Tetra Analytix, and Ed Direction, a division of The Cicero Group. Those firms receive between $320,000 and $887,000 per school, with Ed Direction receiving up to $4.9 million for its 12 schools, the most of any vendor. Trent Kaufman, the company's CEO, said he understands the frustrations of educators, and the skepticism Utahns feel when public education resources are diverted to private interests. But he praised the program as an innovative "pay-for-success" model. If schools fail to improve, the principal and teachers would continue in education, but his company will be shorted millions of dollars. "I hope people will be similarly fair in their judgment as results come out," he said. "We will lose real money if these schools don't turn around." One wrinkle is the school grading system itself, which is designed to become more difficult as Utah schools show widespread success. That happened last year, with the grading scale jumping higher and erasing much of the progress made by turnaround campuses. It is not yet known if turnaround schools will be held to the original grading scale or to the new scale when their three-year term is complete. Nye said the law does not specify which grading scale should be used. Without clarification from lawmakers, he said, it is up to the state board to make that determination, which it has not done yet. "I don't think it would be fair, mostly to the schools, but I'm not afraid of the bar being raised," Kaufman said. "I think the results are going to be pretty strong." Al Hartmann | The Salt Lake Tribune Principal Tyler Howe visits with students in an 8th grade Americn History class at West Lake Junior High School in West Valley City Wednesday Jan. 25.